DC House Of Horrors: A Horror Anthology Coming October 25 | Nerd Much? 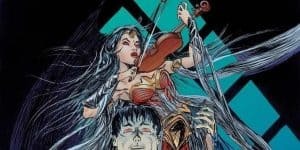 The DC House of Horrors is to be a one-shot anthology featuring a lot of our favorite superheroes, like Wonder Woman, Superman, Green Lantern, and The Flash. It will be releasing just before Halloween on October 25, so be sure to look out for a copy around. At about 80 pages long, the DC House of Horror will herald the combination of some of the best DC writers, including: Brian Keene, Keith Giffen, Weston Ochse, Edward Lee, Mary SanGiovanni, Wrath James White, Nick Cutter, Ronald Malfi, and Bryan Smith. Artists too, of course, including Rags Morales, Bilquis Evely, Howard Porter, Scott Kolins, Dale Eaglesham, and others. I will quietly hope that newly hired to DC Stjepan Sejic is on that list. As the DC report states, all of these talented artists and writers have plenty to work with. Say it with me now, with great power comes great responsibility. Our superheroes have great power in spades, and this comic explores what would happen if morals were a bit more flexible. With the power to move so fast you can alter history, The Flash can do a lot of damage. Or a woman who can glean your darkest secrets could be a phantom straight from the pages of a Japanese horror story. Let’s not forget Batman, who has been painted as a great villain already in the Dark Knight series. Some of the stories within the anthology are described by DC. The first is where Martha Kent fights against an alien creature that landed in front of her house. Another story will focus on a young woman “possessed by the spirit of a murderous Amazon warrior.” The last tidbit we get is described as “the last surviving member of the Justice League faces down a horror beyond imagining” which might very well be their own comrades turned evil.